Offering a polished look with built-in functionality, this power reclining sofa will help you create a living room fit for relaxing, entertaining and everything in between. Curved track arms, smooth back wings and the waterfall chaises create a polished look that your guests will appreciate. This sofa is equipped with independently adjustable reclining and headrest mechanisms that allow you to relax in any position that's most comfortable for you. 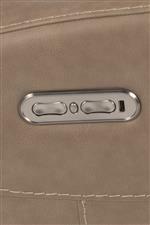 You'll also find a USB port installed on the power control, a Home button that will return this sofa to its upright position when you're done relaxing, and cup-holders that pull out from each arm. This sofa requires 5" of wall clearance. The Latitudes - Asher Contemporary Power Reclining Sofa with Power Headrest by Flexsteel at Conlin's Furniture in the Montana, North Dakota, South Dakota, Minnesota, and Wyoming area. Product availability may vary. Contact us for the most current availability on this product. Fabric Content This leather may display subtle color and texture variances from one piece of furniture to another as well as throughout a single piece of furniture. Fabric Options Available in covers shown. Recliner Mechanism Two power buttons allow you to operate the reclining and headrest mechanisms independently. 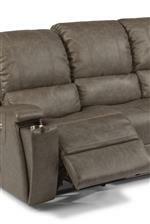 The reclining mechanism allows you to recline to any position. Featuring a contemporary look, built-in functionality and comfort, this power reclining living room collection will help you create the living room you've always dreamed of. Curved track arms, contrast stitching and a smooth waterfall chaise create an all-around polished look that will complement your contemporary or transitional home. 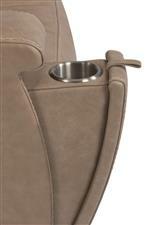 A few of the functionality features include independently adjustable power reclining and headrest mechanisms and pull-out cup holders that will protect your beverages from spilling when you need them and tuck away when you don't. If you're in the market for living room furniture that will help you entertain as well as relax after a long week, this is the collection for you. The Latitudes - Asher collection is a great option if you are looking for Contemporary furniture in the Montana, North Dakota, South Dakota, Minnesota, and Wyoming area. Browse other items in the Latitudes - Asher collection from Conlin's Furniture in the Montana, North Dakota, South Dakota, Minnesota, and Wyoming area.